Posted by heldveld in Book Reviews, Evangelism, Joel Beeke, Puritans. Calvinists are often accused of not caring about evangelism and I know personally its something I haven’t done much of as of yet (not because I’m a Calvinist, I’ll admit it I’m just scared). However, I as someone who knows Jesus as his savior have a strong desire to see others saved. Yet how do we go about evangelism in a Biblical manner? 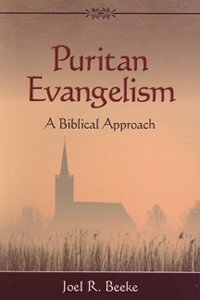 In this short (78 pages) book Dr. Beeke looks at how the Puritans approached evangelism. Here we see that the message is not only for the unsaved but also for the strengthening of those already saved. This is important for two things; first that the church is an important part of evangelism and closely related that evangelism is for believer’s as well. In the first section Dr. Beeke examines some characteristics of Puritan preaching. He starts by explaining how these characteristic differ from the preaching that we see in most modern day preaching. He then details the characteristics. Thoroughly Biblical – The Puritans knew the word of God and worked to pull their messages from the Bible. Unashamedly Doctrinal – They preached the full doctrines of God and Christ not leaving anything out in an attempt to tickle the ears of men. Holistically Evangelistic – The Puritans preached to the whole man. The would not concentrate on the act of making a decision but would use the law to convince sinners of their need for salvation. Studiously Symmetrical – The message of the Puritans was well balanced. They achieved this by preaching the whole bible and appreciated each doctrine found there in. Addressing the Mind – The Puritans desired to show that it is foolish not to seek God. Confrontation of the Conscience – This was the pressing home of the guilt of sin to drive the listener to repentance. Touching the Heart – They showed the immense love of Christ, hoping for a response of gratitude. For the most part, not surprisingly, the Puritan evangelistic endeavor was in the form of preaching. Catechizing was also importing teaching the basic doctrines of the faith to children and new believers to insure an orthodox faith. A final section deals with their disposition. Showing their inward focus they relied on both the Holy Spirit and prayer to focus on God’s work in the conversion of new believers. A good book that gives you a taste of Puritan theology and practice. Its easy to see the good points in their methods. Its definitely not a ‘how to’ on personal evangelism but the individual believer finds important themes to keep in mind. We are also reminded of the importance of the church and of our own need to be reminded of our need for a Savior.